Andrew Roidoulis started his blog, Eight-in-Hand, simply to catalog his growing collection of vintage ties, but he's quickly garnered an audience inspired by his color and texture pairing. He frequently utilizes a little-known knot known as the Oriental or simple knot. "Ties of an older vintage are generally a good deal shorter than those produced today," says Roidoulis. 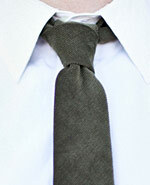 "A small, simple knot gives me the extra length I require and is definitely useful for the bulky wool ties." Looking to make simple, well-made and timeless ties, this Norwegian brand specializes in classic patterns handcrafted by Italian craftsmen in Naples. 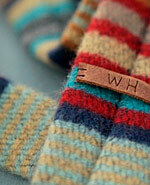 With more and more guys willingly knotting up these days, it's no wonder that there's a boom in neckwear labels. Here are three to keep on your radar this fall. Michael Hitsman, the son of a tailor, was frustrated by the lack of decent American-made ties, so he's now making his own that have a vintage feel with a modern edge. This Rocky Mountain-based Etsy shop uses utilitarian fabrics (duck cloth, denim, linen and deadstock wool blankets) for ties with a rugged, roguish charm.